Ok, so if you have followed this blog for a while, you have probably figured out that I'm a huge Cubs fan. My sister has been a season ticket holder for probably 15 years now and each year I get tickets from her to a handful of games. She gives me a set for each boy to take them to a game for their birthday. My oldest son is as big of a Cubs fan as I am. He's accompanied me to some pretty cool games, including the playoffs in 2007 and 2008. 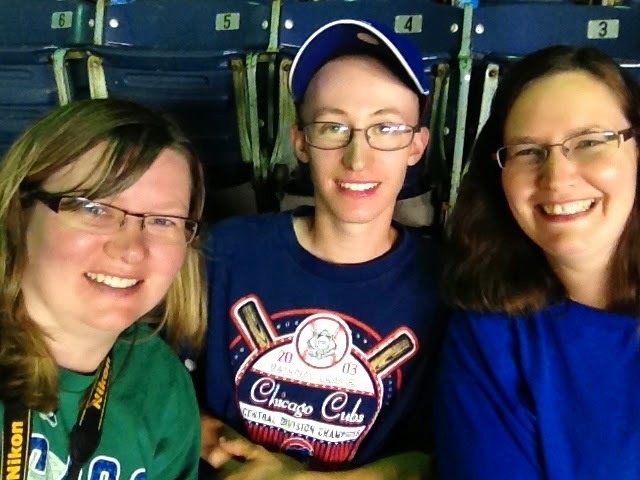 This year when he picked out a game to attend for his birthday, he wanted to go to see a Cubs vs. Yankees game to see Derek Jeter play one last time before he retires from the game. My sister and her husband decided to also go. Although she's the season ticket holder, she hasn't been to a whole lot of games since she moved to Central Illinois about 9 years ago. It was nice to get to see a game with her. It was a rainy night and a crazy, busy night in Wrigleyville. Here's a peek at some of the fun. On most visits to the game, we grab a hot dog in the seats (how can you resist a ball park dog?) and we'll follow up with a meal at a restaurant nearby or maybe eat on the way to the game and grab something about the 5th inning. My son got himself a hot dog with grilled onions. 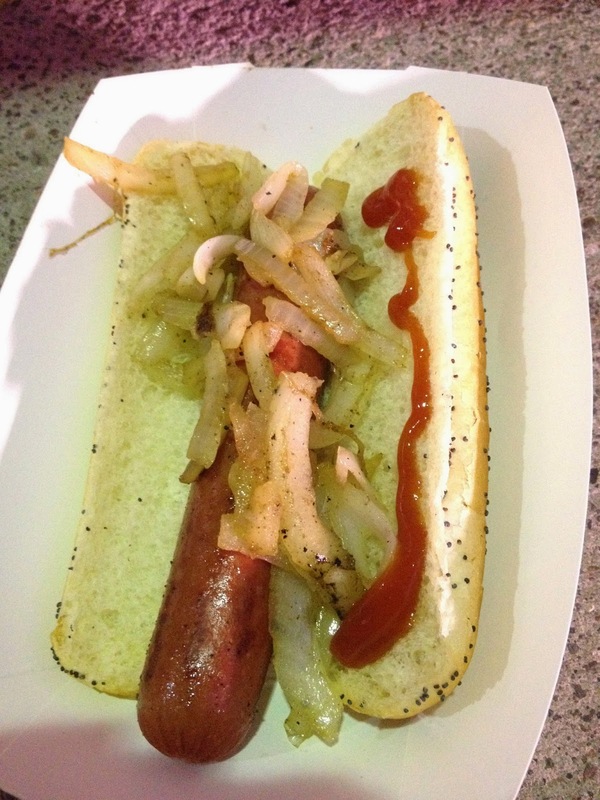 Not a lot of spots in the ball park where you can get a dog on a poppy seed bun with grilled onions. The vendors that come by just have dogs on plain buns with some mustard, ketchup and relish. Just behind our upper deck section is a stand with grilled onions and that's what my son likes to get. I got one of those Wrigley Field beef sandwiches that I love. This picture doesn't do it justice. Since it was rainy and icky I was just relying on my phone so I wouldn't have to take my big Nikon out and get it wet. It was pretty fantastic. As I was taking a bite, the guy to my right looked over with big eyes. His mouth dropped and he said, "Where did you get that?? That thing is beautiful!" And best part of all - the WON! And we got to sing "Go Cubs Go!" at the end. It's a Wrigley tradition for that song to be played as they raise the "W" flag after a win. The last 3 or 4 games I have attended have been disappointing losses, so it was great to end the night with a win. Good food. A charming historic ballpark. My son and sister. And Cubs Win! Can't get much better than that!